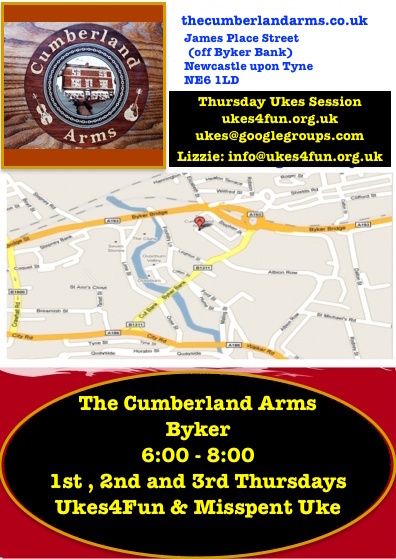 Ukes4Fun – Free “join in” ukulele sessions! From 1st Sept 2016 – not every week – see below! Letter from Dot about the changes to Thursday Sessions. Sunday sessions are NOT suitable for “beginners”. If you have not been before and have a song to play, please don’t be startled when other people do their best to try and sing and play along with you. It is less about having a “spot” and more about taking turns to lead songs. Do not feel shy about handing out song-sheets and inviting people to join you in singing the chorus. There are so many different versions of popular songs and we might be more used to playing a version in a different key, so do mention what key you are playing in. Tempo and rhythm might also be unfamiliar or unexpected, so playing a verse or chorus as an “intro” will help everyone to get in step with you. Try to remember to tell the rest of us what song you are about to play, or expect loud calls of, “What song is it?” and scrambling for song-sheets during the first verse as realisation kicks in! We are building up a bank of Song Books – these use the real chord names. Some songs are versions of the Ukulele Allstars song sheets but priority is given to new songs that have proven “staying power”. It is a very eclectic mix, reflecting the different musical hinterlands of members that so enthrall and inspire us! The song books have been made using the computer program “Songsheet Generator”. If you want make song sheets to bring to session and have not already come across it, I can recommend Songsheet Generator – much easier than using a Word Processor if you want to show chord names above the words and generate chord grids. There are also some useful online tools for making songsheets. The atmosphere is relaxed, there is good real ale and real food on sale (check availability! ), the pub is child and dog-friendly (the children play ukes and the dogs howl in tune! ), we certainly have fun and we welcome anyone who wants to either drop in or attend regularly. Free parking on James Place Street and the field next to the Cumberland – but you might like to be good at reversing to get back out if you park on James Place Street! There is also ample free parking across the main road in the public car park by the Kentucky Fried Chicken, off Shields Road, and even more behind Morrison’s Supermarket. There is a private email list group for members of both the Ukes4Fun! Thursday Sessions and the Sunday Millstone Sessions. Members distribute new songs for sessions using this list – as well as ot instead of bringing copies to sessions. You are also welcome to subscribe to this public blog at ukesFun.org.uk.